Michelle reminded me today of one of my most ridiculous moments of love-inspired moron tax. Following a particularly difficult break-up, I went through a period where I would suddenly dissolve into body-shaking weeping. I would never see it coming, too. One moment, I could be standing in my kitchen munching on a fig newton and, a moment later, find myself buckled to my knees with my forehead pressed to the linoleum, sobbing great globs of snot into the palms of my hands. One day, I went lap swimming at the local pool. I was only halfway through my workout when the sobbing started. I was so sick of being incapacitated by grief that I willed myself to keep swimming despite the crying. I cried so much, the tears began to pool inside my goggles. When I tilted my head to take a breath, the tears would actually roll back into my eyes. 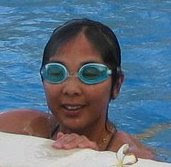 I swam until I stopped crying and by the time I stopped crying, I had filled my goggles with about an 1/8 inch of tears.